This necklace is crocheted from beading wire with silicone stop rings threaded onto the wire randomly as you go along. 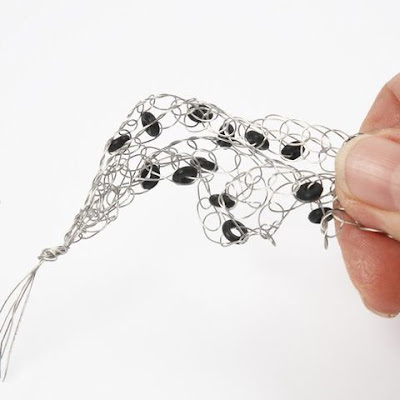 Five crocheted pieces of beading wire have been crocheted to make this necklace. The five necklaces are assembled into one necklace in a magnetic clasp. 1. Thread the silicone stop rings onto the beading wire. 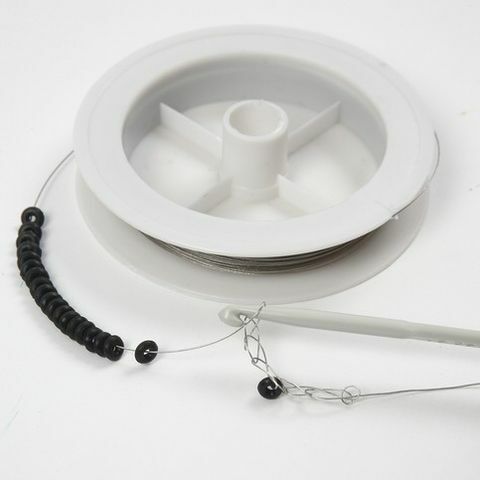 Do not cut off a piece of the beading wire, but leave the beading wire still on the roll. Feel free to choose the number of silicone stop rings. 2. 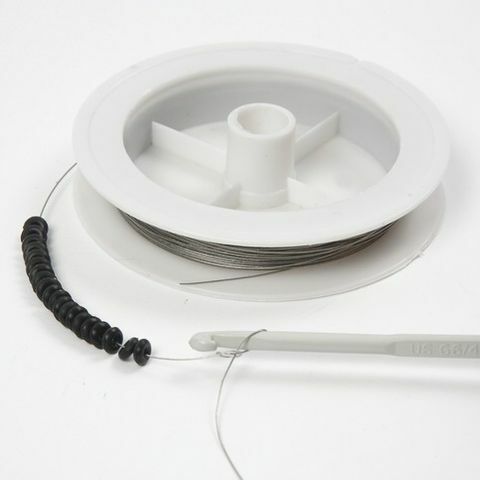 Cast on a stitch at the end of the jewellery wire. 3. 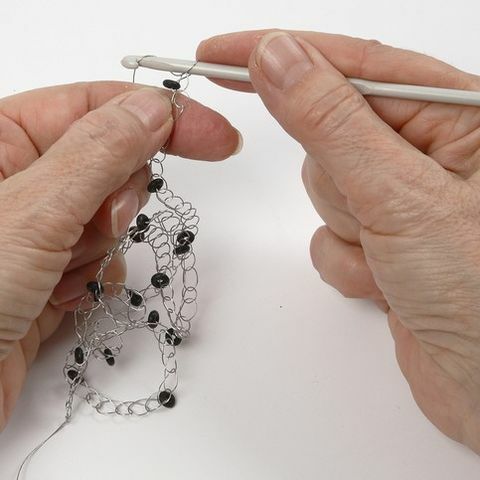 Crochet five or six chain stitches before pulling the first silicone stop ring along the wire towards the nearest stitch. Then continue crocheting. 4. Continue crocheting following the illustrated process until the stretched length of the necklace measures approx. 65cm. Crochet a total number of five pieces of beading wire. 5. 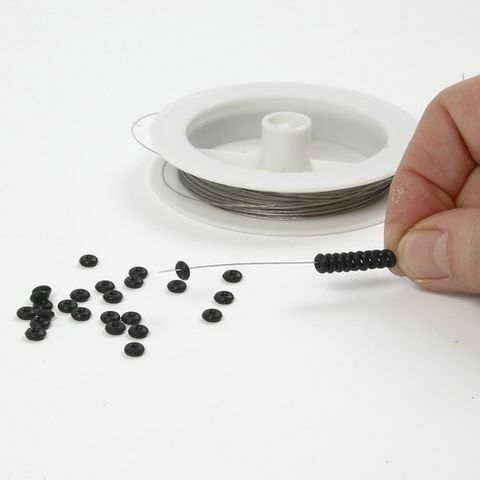 Assemble the ends of the five pieces of crocheted beading wire in a knot and cut off the excess. 6. Add a blob of glue inside both hollow end caps of the magnetic clasp. 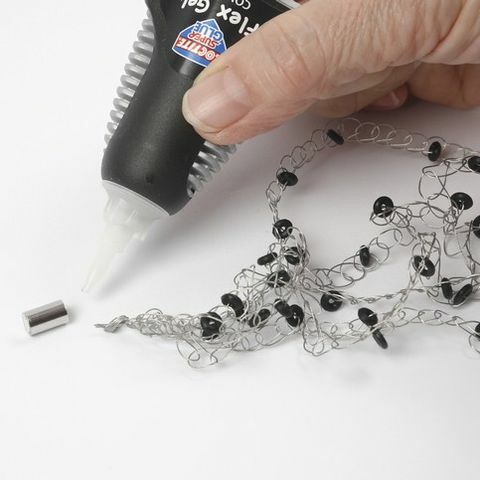 Push each end piece of the crocheted necklace inside the end cap and hold in place until the glue has dried.